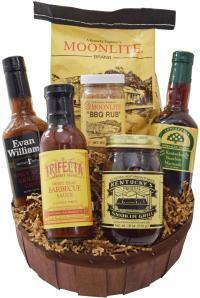 Kentucky is known for its rich barbecue tradition and many barbecue competitions. Here is our version. We’ve included a variety of flavors including bourbon, spicy, sweet and hot. Which is the winner? You decide! If you prefer the basket made without bourbon barbecue sauce, just let us know (in the comments section) and we'll substitute non alcoholic barbecue sauces.